With the console version of hugely popular PC game Terraria coming soon, we thought now would be a great time to chat with Andrew “Redigit” Spinks about all things Terraria. For the budding video game developers out there, maybe you could tell us a little about how you got started with Terraria? I really just started with an idea. I know it sounds clichéd, but I’ve been working on my programming for a while, so when I had the basic idea of what I wanted to accomplish, I started working on it and never looked back! Did you self-learn C#, or do you have a more traditional computer science background? Yeah, “self-learn” is a good word for it. Trial and error have always been my best friend, but in some cases I’ve had to hit up Google to find answers. How long did the development of Terraria take? I’d say I started coming up with concrete ideas somewhere around January of 2011 and immediately started work. And we launched on Steam in May, so I’d say there was roughly anywhere between 4 to 6 months from conception to launch. At what point did you start working with Tiy, and how did you meet? Tiy “officially” joined the project just before we launched to Steam. In the alpha/beta versions, I was responsible for most of the design, but he came in and really helped clean up things and was responsible for additional content design after that. 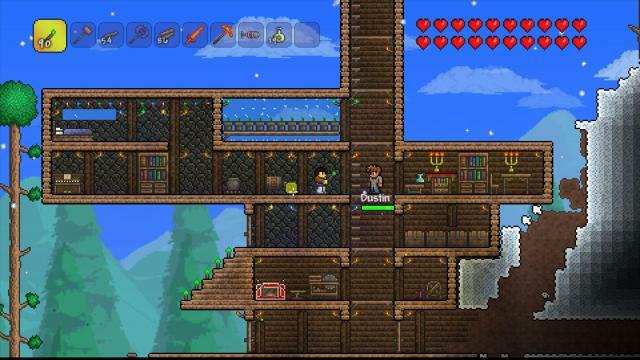 I understand third party developers have expressed an interest in continuing the development on Terraria PC. Is there something you might consider in the future and if not, why? This hasn’t been an easy decision for me. I know there are plenty of very capable devs out there who could do a lot of cool things with the game, but I just feel like I’ve done everything I can, personally, with the PC version. 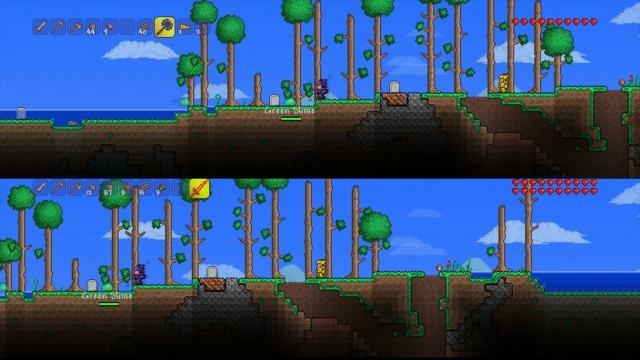 It has always been my intention to take Terraria to console, and there was a point when that felt like the next natural step. How happy are you with the end-results of the console version, and does the extra content that Engine Software developed live up to your expectations? streamline the experience for a console audience and put extra the time in to really stay true to the vision of the game. That was extremely important to me. Thanks to Andrew for his time. Check out the new screenshots below.